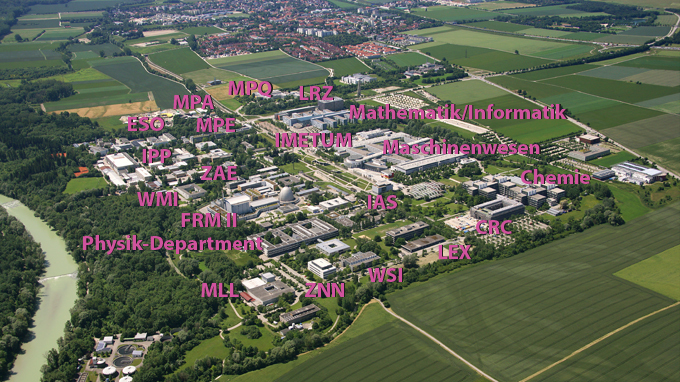 From fundamental research to the development of modern high-tech applications: With more than 6000 employees and more than 13 000 students the research campus Garching in the north of Munich is one of the biggest and most modern science and university centers in whole Europe. Aerial photograph of the campus Garching. Photo: TUM. Not only from a historical view the research neutron source and the physics department of TUM are important as origin of the campus Garching, but also today these institutions emanate scientific attractiveness, initiative and und innovation. And also other numerous, not less famous institutes, faculties and research institutions have settled at this site, namely several faculties of the TUM, institutes of the Max Planck Society, Bavarian Academy of Sciences and Humanities as well as the Ludwig-Maximilians-University. The settlement of companies complements the campus Garching and builds a bridge to the commercial exploitation of innovative ideas. From this unique concentration of numerous research institutes not only optimum conditions for the training of our students arise, but also many scientists from all countries and all fields of research are attracted by the scientific potentials due to the interdisciplinary variety at the campus Garching. We promote talents and guarantee that ideas become transformed into successful research results forming our future! And in the near future additional institutes and companies will be founded to further enrich the fields of activity. In this inspiring environment the physics department of the TUM offers outstanding potentials for students! Collect valuable experiences in cooperation with several research institutions to establish the basis for your professional development! One of the biggest centers for science, research and education in Germany, with a number of research institutions and companies. Studies, work, science and research optimally combined with culture, sports and leisure time.